Your skin is as unique as your DNA. As a result, you’ll age at your own pace, have singular texture and tone concerns, and be exposed to daylight in different amounts than anyone else. If you’d like to refresh the appearance of your skin, there is an abundant selection of facial rejuvenation procedures available that can be customized to suit your distinctive aesthetic needs and goals. Our laser treatments, including the Clear + Brilliant®, Fraxel® DUAL, and Fraxel® Re:pair, can be used alone or in combination with other minimally invasive or surgical procedures to optimize your cosmetic results. 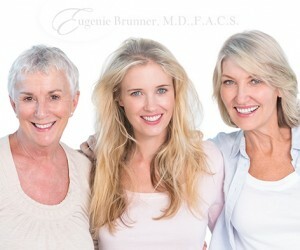 Dr. Eugenie Brunner, our extensively trained facial plastic surgeon, recognizes that “one-size-fits-all” never does, and she will tailor a treatment plan using some of the most advanced techniques developed to address your concerns during your initial consultation. Effective, natural-looking results and patient safety are our highest priorities, and laser skin resurfacing offers an excellent way to achieve significant aesthetic enhancement at any age in a way neither dermal fillers nor a facelift can obtain alone. A facelift, neck lift, or brow lift are designed to reduce skin laxity and severe wrinkles; however, fine lines, skin pigmentation, and uneven texture can’t be corrected with these approaches. Fillers, on the other hand, can diminish the appearance of fine lines and volume loss, but they can’t address discoloration or texture concerns. If you’re experiencing a combination of problems, such as skin laxity, uneven skin tone and texture, and volume loss, a personalized treatment plan using multiple modalities typically can maximize your outcome. Dr. Brunner recognizes that your cosmetic needs and goals will change throughout your life, and she offers a comprehensive selection of laser, surgical, and non-surgical treatments to suit your anatomic indicators and desired outcome. Whether you’re in your 20s or your 70s, she can develop an individualized approach that respects and enhances your unique beauty. If you have additional questions about our facial and body rejuvenation treatments or our laser skin resurfacing options, or if you would like to schedule a consultation with Dr. Brunner, please contact our office today.